General Topics & Doctrine | Iraq -- Babylon of the End-Times? | Watchman Fellowship, Inc.
Iraq -- Babylon of the End-Times? Contents: 143 pages with notes. Do current events in Iraq and the Middle East signal the beginning of the end-times? Authors Pate and Hays believe in biblical prophecy, but they also know itís crucial to distinguish correct interpretations of prophecy from incorrect ones. 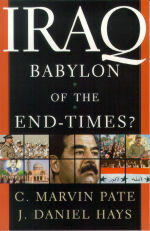 Iraq-Babylon of the End-Times? provides a sensible approach to examining current events in the Middle East in light of biblical prophecy and geopolitical history. Are the political enemies of America the biblical enemies of God? How accurate is the biblical interpretation popularized by the Left Behind series? What is the significance of Saddam Husseinís self-identification with Nebuchadnezzar? According to Bible prophecy, must Babylon be rebuilt and destroyed again? Are the modern-day Iraqis related to the ancient Babylonians? Could the prophet Danielís ìrevived Roman Empireî refer to the European Union or the United Nations?